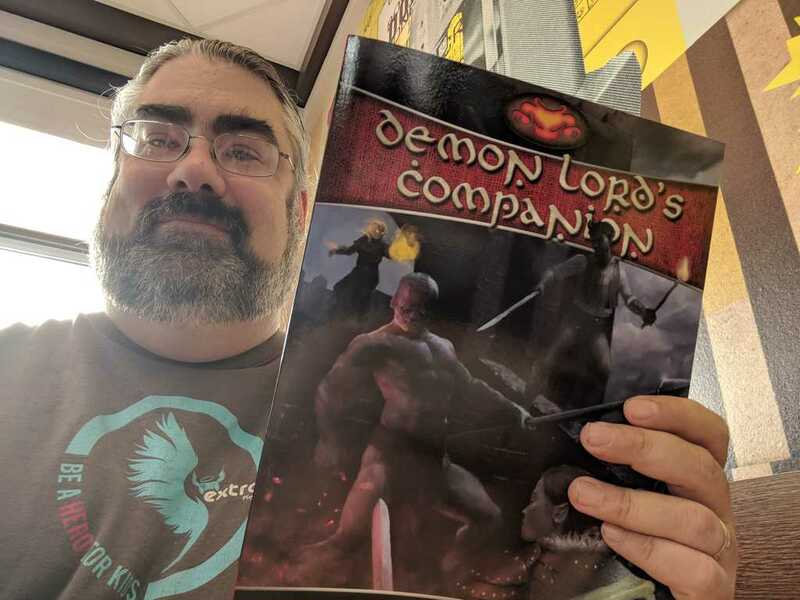 Let’s take a look at Demon Lord’s Companion a supplement for the roleplaying game Shadow of the Demon Lord by Robert Schwalb. This was my #RPGaMonth Challenge book for March 2019. The goal of this challenge is to get some use out of those roleplaying games/modules/splatbooks that you picked up but never actually sat down and read. Whether that means loading up the PDF reader or dusting off a book from your shelf of shame, it doesn’t matter. There are two reasons why I chose this book for my March #RPGaMonth book. The first was the fact that I really enjoyed reading Shadow of the Demon Lord , which was my #RPGaMonth book for February. Check out last month’s review for exactly what I liked about this grim-dark RPG. Since I enjoyed the core book so much it just made sense to read something else for the same system. The second reason was that I went on Twitter asking people what I should read next. I remember putting up a short list, though I don’t remember exactly what was on it, this was one of the three books I mentioned. Every single response I received pointed to reading this book. 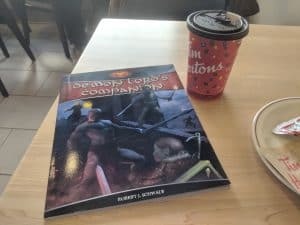 Unlike the Shadow of the Demon Lord core rulebook , this supplement is a softcover book. Another significant change is the paper. 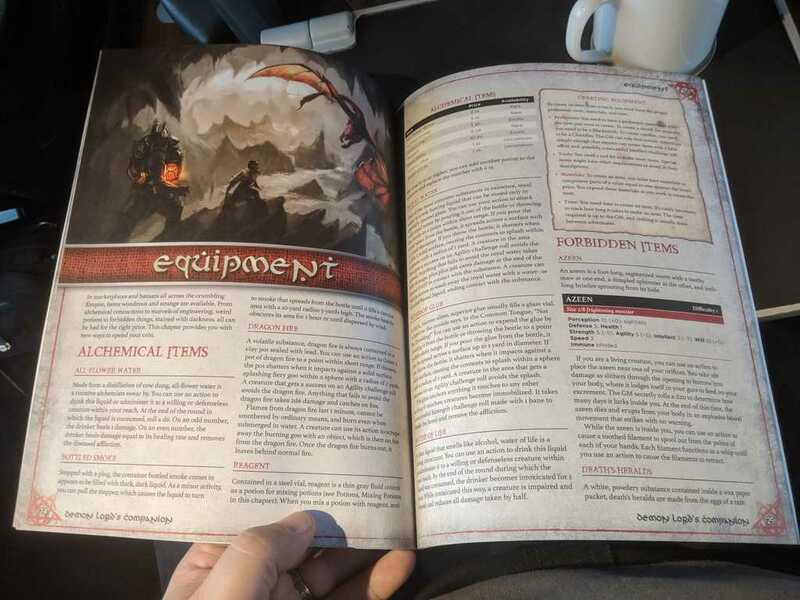 The paper used in Demon Lord’s Companion is thicker, more papery and matt as opposed to glossy. I actually think this is a good thing as it’s a bit easier to read and doesn’t reflect nearby light. The book is full colour and filled with evocative artwork. As Shadow of the Demon Lord is a fantasy-horror game, some of the imagery is distinctly adult in nature and NSFW (not safe for work). For such a small book there’s a ton of art in here. It’s almost on every page. Speaking of small, Demon Lord’s Companion only clocks in at 50 pages and that’s counting things like the index, intro and table of contents. I couldn’t help but think that this book is small enough, why wasn’t it included in the core rulebook, something Robert Schwalb actually addresses in a short introduction. 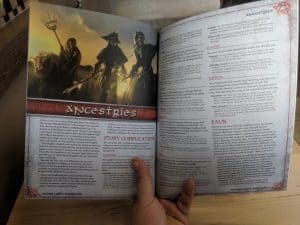 This chapter mirrors Chapter 1 in the core rulebook and presents two new ancestries players can choose from when making characters. The first is the Fawn, an offspring of humans and fey folk. The second is the Halfling which was clearly inspired by Tolkien. 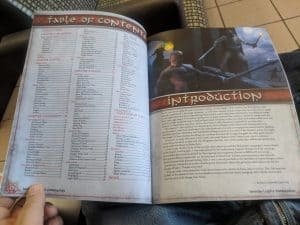 The information here matches that in the core book, including things like random tables for determining physical features, backgrounds and personality. 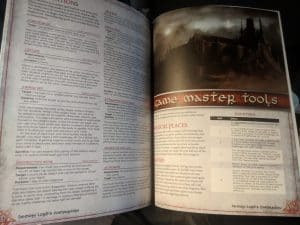 This chapter also includes rules for Story Complications, something that players of a specific Ancestry can use to add some uniqueness and complications to their characters. Here we find a significant number of new paths for characters to follow as they progress through Shadow of the Demon Lord. I found it interesting that there were no new Novice Paths. So players are still stuck with picking between Magician, Priest, Rogue and Warrior when they start off, but a number of new Expert and Master Paths are added. There are Expert paths for Faith, Power, Trickery and War. Each of these includes two specific paths. For example, you will find Warden under the path of Faith and Mystic under the path of War. 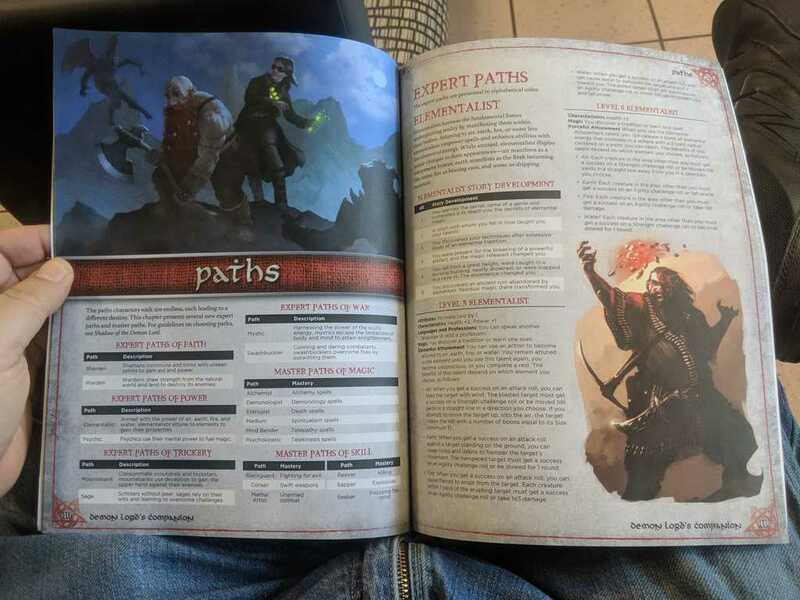 Twelve new master paths are listed, split between Paths of Magic and Paths of Skill. One of the key features Demon Lord’s Companion adds to your Demon Lord game is Psionics. Here you will find Paths like Mind Bender and Psychokinetic. It’s worth noting that there aren’t any special rules for Psionics. It’s not a sub system for the game but rather just uses the same system that magic uses. So really psionics are just another type of character ability that works the same as everything in the core book. I think this is a good way to approach things. The format of this chapter mirrors the main rulebook. With each path listing story developments, attribute changes, new languages gained, magic learned, etc. One of the things I found interesting about Shadow of the Demon Lord was that the technological level is significantly higher than most other fantasy settings. This chapter of Demon Lord’s Companion reinforces that feeling. The chapter starts off with a bunch of new Alchemical Items including some Forbidden Items. It then gets into Marvels of Engineering which includes all manor of stuff you don’t see in your average D&D game. Flares, smoke bombs, pocket watches and bombs to name a few. 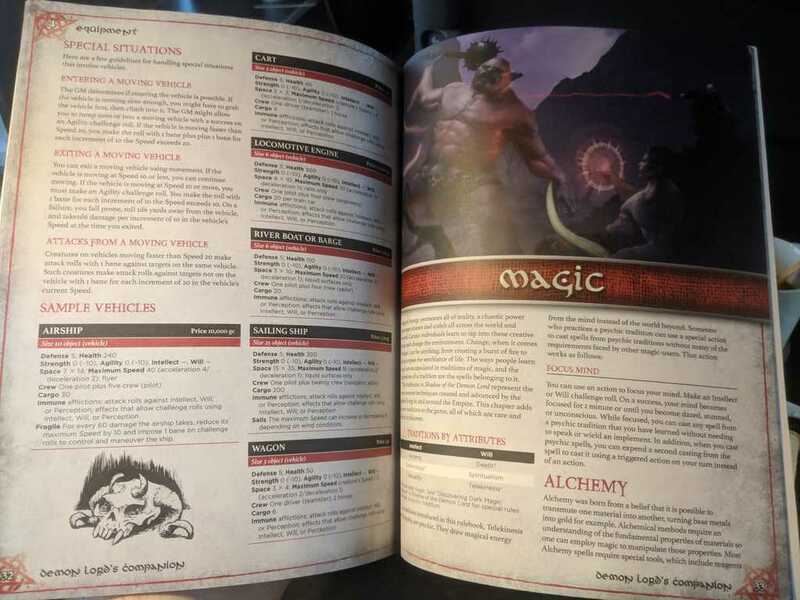 Bringing things a bit back into the fantasy realm there are new rules for potions including a table that brings back fond memories of the AD&D 2e Dungeon Master’s Guide: Mixing Potions. The last part of this section of the book provides a full set of vehicle rules and the stats for a bunch of different vehicles to use with these new rules. These rules are a mix of crunch and narrative rules that match with the rest of the system well. It’s enough to keep those gamers who dig things like tracking acceleration and opposing vehicle speeds engaged while not getting into exacting detail and making a modern Car Wars. Six new types of magic are presented here. You have Alchemy, Demonology, Telepathy, Death, Spiritualism and Telekinesis. See I told you psionics are just treated as magic. Okay, I lied, just a little bit. The way a Psionic prepares their spells is just a little bit different, using an ability called Focus Mind. A small change that makes psionics a bit unique while still sticking to most of the regular rules. It’s also worth noting that two of these new magic traditions are dark magic. Something prevalent in the setting. 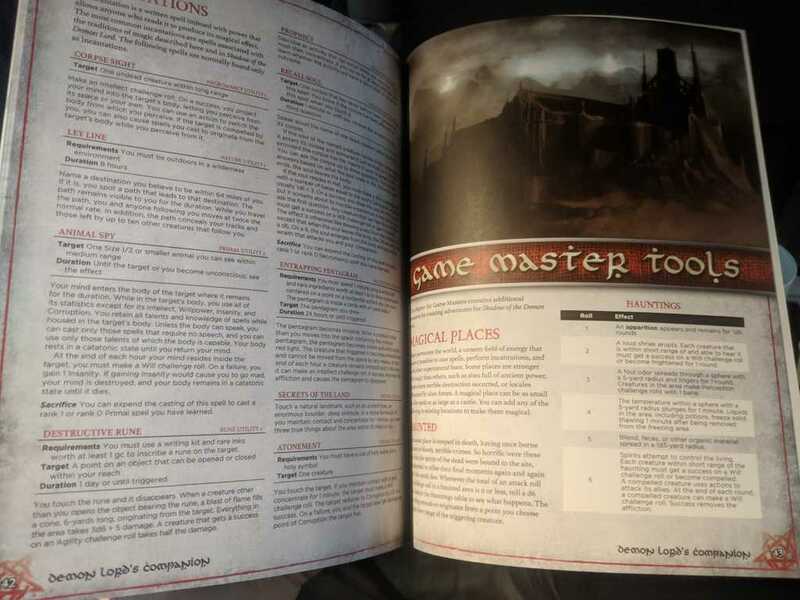 The final chapter of Demon Lord’s Companion provides some new tools for the Game Master. These start off with Magical Places. These rules give the GM tools to make a location be filled with Null Magic, Haunted or be a place where the Void is leaking into reality. Up next we have Relics. These are the Shadow of the Demon Lord equivalent of Artifacts from most other fantasy RPGs. Befitting the setting, most of these have as many drawbacks and costs as they do offer character boons. This final chapter finishes off with a mini-Bestiary. Here you will find nine new creatures to add to your game. Most of these are lower difficulty level, which I think is a good thing as the core book had few low level baddies for a new party to encounter. I’m sure I’m not the only one sick of fighting goblins at first level. Despite the explanation from Robert Schwalb that most of this content was created for the game due to Kickstarter stretch goals and that they were never expected to be in the main book, I can’t help but feel that all of this did, in fact, belong in the core rulebook I read last month. A big part of that is how small each individual chapter is. Take a look at the Bestiary, surely those nine additional creatures could have fit into the original book? Thinking logically about it, I get it. Every bit of content added makes the book longer and bigger. That makes the book cost more to produce and means that the end product would cost more. At what point does it get so big that it’s either too expensive or too intimidating to draw new gamers in. So I begrudgingly admit that it probably makes more sense to have this content as a separate book. Maybe I would have been happier if this book was bigger itself. In some cases, it feels like Demon Lord’s Companion just scratches the surface. Why only have nine new monsters when you could have had eighteen? Why only two new Ancestries when I know there are other books out there with more of them? Why only one Airship in the vehicle section? Ignoring what I think may have been better in or out of this book, the stuff that is here is all solid. It’s all good stuff written and presented to the same level of quality you will find in the core rulebook. In particular, I really like how psionics was handled without having to add a whole new thing to the system. It doesn’t even feel tacked on. I also dig the vehicle rules, as that’s something you don’t see often in a fantasy RPG ruleset. To me, the least interesting parts are the new player options but I think that’s just because we haven’t actually played the core game yet, so these are just more options among many. If you have a group that has played Demon Lord for some time, you are probably going to be more excited about things like new Ancestries and Paths. The one great thing about this book is that the price is right. The MSRP is only $19.95(US). At that price point, I think there’s a lot of bang for your buck here. While I don’t think this is a must have expansion book, there’s some good stuff here. I don’t think you need the information in this book, but there’s no way I can see how having it could hurt your game. Have you read Demon Lord’s Companion? What did you think? Let me know in the comments below!